Garage: "Garage: 2 Car Attached, Underground Parking; Parking Space(s): 2"
Enjoy living along the banks of South Saskatchewan River, at Waters Edge 1, located on Saskatchewan Crescent. A quality build by Northridge Developments. Walking trails and parks are close at hand. This condo property shows immaculate. A modern, cozy, open concept home that offers river views, espresso maple kitchen cabinets with glass tile back splash, large island with Granite counter tops throughout, stainless steel appliances, nine foot ceilings and crown moulding. Two bedrooms, large master bedroom with two over sized windows, walk in closet, full glass ensuite shower. Two bathrooms, with extra storage closet in the main bath. Utility room with storage area, Maytag washer and dryer and central vacuum. Good sized balcony with barbecue gas hookup. 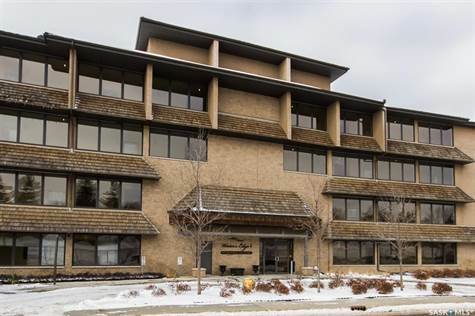 Additional enclosed underground storage unit and TWO underground heated parking spots! A great building with an excellent reserve fund, an exercise room, amenities room, guest suite and an elevator with wheelchair accessibility. Condo fees include heat and water. Must be seen!